monastic should possess and observe. 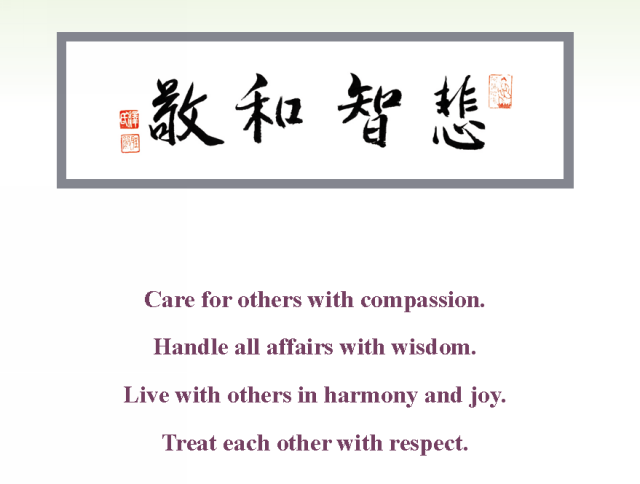 As our founder Master Sheng Yen said, “Harmony meansharmony with others. Respect means respect for others. Harmony and respect are standards for the monastic community. Compassion and wisdom are the very spirit of bodhisattvas, and the requisite qualities for treading the bodhisattva path. We have taken Compassion, Wisdom, Harmony, Respect as the university motto in the hope that students will develop themselves into monastic bodhisattvas who though appear as shravakas (Theravada monastics), but nonetheless cultivate the bodhisattva path. This is the most distinctive feature of the University.